Professor of history, ethics, and human rights at the University of Groningen, the Netherlands; author of Crimes against History (2019); founder-coordinator of the Network of Concerned Historians since 1995. Many of us may remember Syrian archaeologist and historian Khaled al-Asaad. A director of the Antiquities Department in the ancient town of Palmyra for decades, he was detained in 2015 by Islamic State militants at age 81. They interrogated him for over a month because they wanted to know where his collaborators had hidden saleable artifacts. When he refused to reveal their location, he was beheaded in front of a crowd at a square in Tadmur, next to Palmyra. His body was first left on the ground, then suspended from a traffic light, his severed head underneath it. A handwritten placard tied to his body contained six charges: he served as the “director of idolatry” at Palmyra, he was an apostate, he was loyal to the al-Assad regime, he represented Syria at “infidel conferences,” he visited Iran, and he communicated with the security services. His body was then taken to Palmyra and hung from one of the Roman columns, while IS supporters circulated photos of the body online. 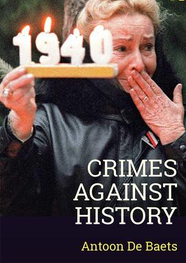 Crimes in history are often well studied, crimes against history are not. The latter have in common that they destroy either the messages or their producers. Crimes against history comprise any of the following acts when committed as part of a widespread or systematic attack pursuant to or in furtherance of a state or non-state policy: the assassination and disappearance of historians; public personal attacks on historians through hate speech, defamation, and malicious prosecution; the intentional destruction of cultural heritage; and disinformation, including fake news, genocide denial, and the censorship of history. Crimes against history attack the core of historical writing – its integrity. At times, censors of history resort to extreme solutions. They do not “simply” suppress individual historical messages but destroy their vehicles or even kill their producers. Censors become hecklers, killers, and avengers. In Crimes Against History, I estimate that from the dawn of time 428 historians around the globe have been killed for political reasons. More than half of them were murdered after 1945, al-Asaad being one of the more recent cases. Alternatively, heads of state and government have tried to kill historians not physically but psychologically by publicly attacking them on account of their critical attitudes, often by spreading hate messages about them, defaming them, or unjustly prosecuting them. In the same vain, “fake news” and its corollary “disinformation” are threats to historians in many countries. Less recognizable than murder or character assassination and more insidious, disinformation is censorship’s twin. Yet another form of attack against history is the intentional destruction of cultural heritage. Many political systems have tried to sweep the remnants of the past away and start from the year zero. After 1945, regimes who followed this path of destruction had a communist, nationalist, or Islamist signature. The Cultural Revolution in China was initiated by Communist Party leader Mao Zedong in 1966. It was set up to “smash the Four Olds” – old ideas, old culture, old customs, and old habits. One of the results was the demolition of over 6,000 monasteries (reportedly 95 to 97 percent of the total) in Tibet. During the wars that raged over the territories of Yugoslavia in 1991–1995 and led to its breakup, all sides in the conflict destroyed archives, monuments, and sites in a deliberate effort to achieve what was variously called cultural cleansing, crimes against culture, and bibliocide. In Afghanistan, the Taliban issued an edict to destroy the world’s two largest standing Buddha statues at Bamiyan on the Silk Road. The destruction went ahead in March 2001. Although iconoclastic regimes are transient phenomena, some take a long time to disappear. Meanwhile, they can destroy the entire texture of society. In any case, they are not easily forgotten and may haunt the public imagination for generations, if not centuries. In their relentless efforts to destroy the past, they achieve some of the immortality and posthumous fame they yearned for. But they survive not in recollections of pride but in collective memories of horror. Iconoclasm is a supreme form of censorship. It is for cultural heritage what killing is for people. Sometimes, however, the censors organize their own funeral. The censorship of history has chilling effects, certainly, but it also generates backlash. It possesses the curious self-defeating tendency to highlight what it wishes to hide. The historians it targets invent techniques to evade it. When they cannot speak openly, they may introduce historical analogies through which they comment on the present by speaking about the past. Take two causes célèbres. In the first controversy, prominent German historian Ludwig Quidde in 1894 compared the German Kaiser Wilhelm II to Roman Emperor Caligula. He was threatened with a defamation trial and professionally ostracized. In the second, Chinese historian Wu Han had written a biography of the first Ming Emperor, Zhu Yuanzhang. Upon reading it in 1949, Mao perceived it as a negative commentary on his own rule. Although Wu rewrote the biography several times, Mao was not satisfied. After he attacked Wu in public in 1965, the latter was thrown in prison, where he died almost three years later. Or take the lesser known case of dissident historian Ali Shariati, one of the outstanding ideologues of the Iranian Revolution. In the 1970s, he lectured against the Shah at a religious center in Tehran. These lectures had tremendous nationwide success and contained stories about “the Pharaoh” and “Umayyad Caliph Yazid I”. These were code words for the Shah and this was quickly perceived by the audience. In an act of stunning incomprehension, it took the secret police SAVAK six months to realize what was going on. When such analogies stick to memory, they transform into templates for conversation, criticism, and action. In a unique reflex, historians throw light on recent injustice by talking about remote injustice and by referring to freedom in times past. In so doing, they arouse historical consciousness and briefly bring relief.If successful, historical analogies are small victories against autocratic power. Many historians living in repressive contexts went beyond the tool of historical analogies and expressed solidarity with their persecuted colleagues. Italian historian Federico Chabod did just this. When his teacher Gaetano Salvemini was persecuted for his anti-Fascist activities in 1925, he helped him escape across the border to France. Chabod also actively assisted his colleagues who had fallen out of grace after the 1938 race laws. During the war, he became a partisan leader, but he had to go into exile himself in 1944–1945. In the 1950s, when he acted as the president of the International Committee of Historical Sciences, he was known for his support of Eastern European historians after the crises of 1956. In many creative ways, historians have resisted the assault of power on the past tacitly or openly. They exploited the smaller or larger margins of freedom, often at great risk. Over time, a surprising amount of these acts have become examples of moral courage. There is a stubborn tradition in the historical profession of holding high the standards of scholarly integrity in the face of likely censorship. Intrinsically fragile as they are, acts of moral courage possess one powerful characteristic: they can inspire long after the facts to which they refer have disappeared. As long as they are retold, stories of commitment and integrity inspire hope and pride. Those who died while exercising their right to history are testimony to the fact that the historian’s craft is vulnerable, that its integrity needs constant vigilance and protection, that the defence of its basic principles is a duty for all, always, and everywhere. Those who resisted the censorship of history and fought organized oblivion safeguarded the integrity of the historian’s craft and often inspired or comforted others who otherwise felt alone and powerless. I am writing these lines when the very idea of human rights has come under sustained attack and when some talk about a “post-human-rights world.” Historians, however, should defend the best idea humanity ever had: human rights. Why? If not for the idea itself, then at least because history as a craft can only flourish in a democratic society that respects human rights and freedoms necessary to protect its responsible exercise. How? By speaking out for these rights and freedoms. By combatting the crimes against history. As al-Asaad did before he became the victim of just such a crime.